Discover Antebellum Remade In The Historic Heartland Of Covington, Georgia. Only 30 Minutes From Atlanta. We are located within walking distance of the charming historic downtown Covington square with wonderful shops and restaurants such as the local ice cream parlor Scoops that overlooks the square. Whether you’re looking for a nice local park, a state-of-the-art library, or cultural activities that include a local Arts Association or local wine tasting, Covington offers something for every member of the family. Experience a local tour, peruse the local shops and restaurants. There is something special about carousing around Historic Covington. There is so much rich history to be found here in Covington, and this walking tour will take you up and down the streets lined with historic homes and give you information about the history of each historic home. We recommend taking this self-guided tour if you love history or just want to see beautiful historic architecture! Location: Brochures are available in the Covington Visitor’s Center off the historic square on Clark street, or also available at The Twelve Oaks front desk. Cost: FREE. Visit http://gocovington.com/ for more. Experienced Ghost Guides will give you a walk around a city rich with Haunted History, while you get a taste of the “Hollywood of the South.” As you visit a multitude of haunted sites, you will visit filming locations for television shows such as “In the Heat of the Night,” “Dukes of Hazzard,” and “The Vampire Diaries.” Covington Ghost Tours differs from most haunted tours because many locations have been investigated by paranormal experts that are associated with T.A.P.S. (The Atlantic Paranormal Society). 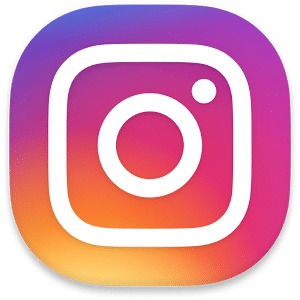 You will also witness actual video accounts from people who have experienced paranormal activity first-hand at various tour stops. Be prepared to feel the hairs stand up on the back of your neck! Visit http://www.covingtonghosttours.com for more. If you’re looking to do a little “vampire stalking” while you’re here in Covington, then the Mystic Falls Tours is probably the best place to start! 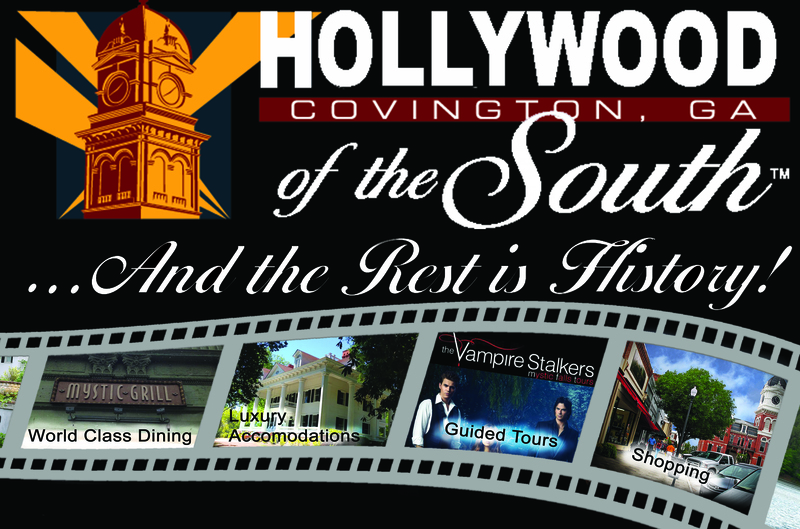 Jessica has one tour that takes you around Vampire Diaries filming locations in Covington, and a second that takes you around The Originals filming locations over in Conyers. Jessica loves to discuss and share her knowledge with all Vampire Diaries fans and their love of Vampires, Werewolves, Witches, and Hybrids. The tour goes through many outdoor locations where Jessica will talk about the scenes filmed at each site, and you can take photos re-enacting the scenes to share with your friends when you get home! 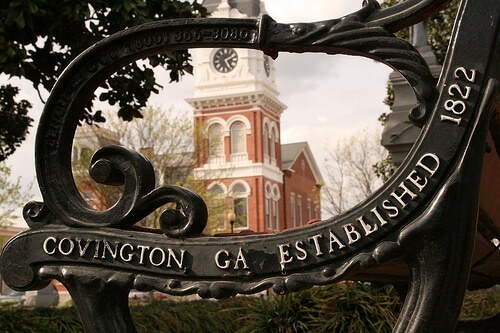 Location: The Vampire Diaries tour starts at the Covington Visitors Center on Clark Street; The Originals tour starts at the Conyers Visitor Center off Railroad Street, which is about 15 minutes away. Cost: $$. Visit http://www.mysticfallstours.com/ to book. Meet your Tour Guides at The Historical Monument in the center of the Covington Square. The Guides will tell you how the legacy of Porterdale began in Covington. Guides will then lead your vehicle on a 3 mile Caravan into the attached Cotton Mill Village of Porterdale. The tour stops at several locations where tourists will have the opportunity to exit their vehicles for stories and to enter select locations. The “Dusk” Tour is an adult (21 and over) evening caravan & walk through town that begins in The Historical Covington Square. The Tour Guides will then lead a caravan into the Haunted attached Mill Village of Porterdale. Upon arrival in Porterdale, Guests will be served Wine/Beer in Porterdales new Italian restaurant Milazzo’s then head out on the Haunted Investigation. Location: Historic Porterdale (Just a short drive from the inn). Cost: $. Visit The Porterdale History Tour/ to book. If you’re looking to taste some great wine, we recommend heading over to this little gem. The Cork showcases unique, high-quality boutique wines, craft beers, cigars and cheese and gourmet food items from around the world. Pick up a bottle of wine and bring it back to enjoy during your stay at The Twelve Oaks, or give a bottle as a gift to someone for a special occasion. Location: On the historic square (within walking distance to the Inn). Cost: $$. Visit http://thecorkboutiqueandgifts.com/ for more. Town Square Olive Oil’s inviting store offers you a unique tasting experience of over 65 varieties of olive oil and balsamic vinegars from around the world. Treat your taste buds to an incredible array of flavors from Italy, Spain, Greece, Chile, Australia and other exotic destinations. Taste and explore the endless possibilities and pairing combinations of their gourmet oils and vinegars before you buy. Their products also make for unique and wonderful gifts! Location: On the historic square (within walking distance to the Inn). Cost: $. Visit http://townsquareoliveoil.com/ for more. One of the trendiest boutiques you’ll find in the downtown Covington area! If you’re going to spend the day shopping on the square, you should pop in to the Shelvie Jean boutique and spend a couple hours trying on clothes and accessories. You might even find something you love so much you’ll want to wear it right away! Location: On the historic square (within walking distance to the Inn). Cost: $$. Visit https://www.facebook.com/shopshelviejean for more. WildArt is a new and innovative art studio located in the heart of Historic Square, Covington, Georgia. The exposed brick walls and tall ceilings lend character to the place which was once the facade for the Vampire Diaries TV show. WildArt represents a number of local artists who show their finest work. The impressive artist’s inventory features a wide variety of paintings and artistic media in many styles, including figurative, abstract, landscape, still life,wood turning, hand-spun writing instruments and many others. Works by both emerging craftsmen and award-winning established artists are featured in equal number, lending a lively atmosphere of discovery, to the space, unequaled by most area galleries. WildArt has already secured a reputation for showcasing exceptional artwork and providing excellent service to private and corporate patrons as well as the novice collector. The back of the gallery space is dedicated to art classes and special events designed to involve the community. The “Just Paint” studio on Thursday, Friday, and Saturday nights are very popular with adults and children alike. Summer Arty Art Camps and varied workshops keep us busy all year long. (within walking distance to the Inn). Cost: $$. Visit WildArt LLC for more. They are your source for the visual arts. They also have classroom and event space available. Visit Southern Heartland Art Gallery Facebook for more. Don’t Mind a short drive? Since we are so centrally located, there are endless possibilities to explore. Here are some destinations you can add to your itinerary. Marvel at the beauty of this monastery that is taken care of by monks living there. Their visitor center features interactive displays, exhibits and videos about the monastic tradition, as well as the Trappist monks at the Monastery of the Holy Spirit. The monks have different shops selling the goods they’ve made, and Nicole’s favorite is the bakery. They have some of the freshest, most delicious breads for sale in their bakery and we recommend picking up some of their baked goods while you’re there. Location: On Hwy 212, about 27 minutes away in Conyers. Cost: $. Visit http://www.trappist.net/ for more. The Walk of Heroes Veterans War Memorial is developed around a visual and interactive concept to cultivate a public understanding of the sacrifices made by veterans on the battlefields during and since the 20th century and by their families whose sacrifices helped to protect and maintain the freedom enjoyed by Americans today. Take an hour to explore in the peaceful atmosphere of the Walk, providing an appropriate setting for to reflect upon the sacrifices made and to truly appreciate the freedom enjoyed by generations. Location: On Black Shoals Road in Conyers, about 24 minutes away. Cost: FREE. Visit http://www.walkofheroes.org/ for more. Seasonal – From December-January, an outdoor ice skating rink sets up in Conyers for a little wintry fun! Take your sweetie and have a romantic evening gliding around the rink and enjoying some hot chocolate together, or go with friends and have a blast racing around the rink. You’re sure to have hours of enjoyment with this winter favorite! Location: In the Olde Town Conyers Pavilion located off Main Street in Conyers, about 15 minutes away. Cost: $. Visit http://icedaysconyers.com/ for more. Don’t Mind a little Further drive? The surrounding areas like Atlanta, Stone Mountain and Athens, are packed with even more to do! This state-of-the-art exhibit is home to four whale sharks, four manta rays & schools of rainbow runners. Guests have the option to participate in the Journey with Gentle Giants Swim or Dive Program. Book one of these once-in-a-lifetime opportunities today! Whale sharks, Beluga whales, Bottlenose dolphins, and much more! Get Face to Face with your Favorite Ocean Life. To Learn More About Tour and Ticket Information. We all love going to see the shows put on at the fabulous Fox Theater! From The Sound of Music to The Little Mermaid, every month there’s always a new list of shows that will be shown, so you’re sure you find one you’ll enjoy. Pick an evening show time and head into Atlanta early to have dinner at one of the wonderful nearby restaurants. To Learn More About Tickets and Show Schedules. Save 43% on admission to the 5 BEST Atlanta attractions. What an easy way to experience the city. One CityPASS purchase and you’re set with actual admission tickets, contact info, insider tips and more. Save time and money, skip most ticket lines and see Atlanta like a VIP for less! Ask for CityPASS when you arrive at our World of Coca-Cola ticketing windows or buy online for the same low price. To Purchase Your Tickets and Learn More. Plan to have a day of fun at the Six Flags theme park! Two of our favorite rides include the Superman roller coaster that is sure to have you soaring, and the Goliath roller coaster that will take you up one of the highest inclines and send you spiraling around the park. Enjoy lunch in one of the many restaurants in the park, and then head over to have your picture drawn by a cartoonist or try your luck at one of the many arcade games. And don’t forget to pick up a funnel cake! You’re sure to create some memories and take home some hilarious prizes! Location: — Cost: $$. Visit Sixflags.com for more. From pulse-pounding speed slides to gentler options for tots, there are some amazing options for fun at Whitewater. From the activity pool to the Bahama bob slide, there are plenty of water rides to keep you cool in the warm summer weather. Catch a bite to eat in one of the restaurants and don’t forget to pick up your souvenirs so you can remember the day! Location: — Cost: $$. Visit Whitewater for more. If you’re looking for some outdoor fun during your stay, then we recommend taking a trip over to Stone Mountain Park and making a day of it. Start with a scenic hike up the mountain (or ride the Skylift if you’re not in the mood to hike) and take in the beautiful views of the surrounding cities from the mountain top. Then head down to the shopping area for lunch and to see some craftsmen working on hand blown glass, or head into the petting zoo to feed a few furry friends. And don’t forget to see the laser light show at night. Cuddle up with your sweetie to enjoy the show from the comfort of one of the terraces which showcase an outstanding view of the mountain, its famous carving and the world’s longest running Lasershow. Three flame cannons send a trio of flames nearly one-hundred feet into the air, and fireworks spray multi-colored bursts that dance on the water at the base of the mountain. You won’t want to miss it! Location: Main entrance is an exit off Hwy 78, about 45 minutes away. Cost: $. Visit http://www.stonemountainpark.com/ for more. Need some outdoor fun during your stay? Head out to Lake Oconee near Athens, GA for a day of boating, swimming, and fishing. Rent a boat or even a couple wave runners for the day and spend some time on the water. Take your fishing poles and reel in a big catch, or simply lounge together and soak up the sun. Location: — Cost: $. Visit LakeOconee.com for more. Athens is home to one of Nicole and John’s favorite teams, the Georgia Bulldogs! If you happen to be in town during football season, see if you can grab tickets to one of the games. In addition to football, they also have amazing gymnastics team meets, which are fabulous to watch, or also basketball games. There are plenty of different sports to enjoy year-round! Location: — Cost: $$. Visit UGA.com for more. The home, town and people were all exceptional! From the moment we drove onto the Twelve Oaks B&B, we were in awe of the opulence. Every room was immaculate and designed with an amazing eye for period authenticity. Nicole, John and staff greeted us and encouraged us to look around and enjoy the property. The large front and back porches and the huge yard made for a quiet and relaxing stay. The breakfasts were delicious each day and we lingered over coffee with other guests who became fast friends. Of note were the strawberry/raspberry topped pancakes and stuffed French toast—Mmmm! We thoroughly enjoyed an in-room massage with Selena, dined at the Mystic Grill of the Vampire Diaries fame, were spooked on our ghost tour offered through Wild Art and of course had our fill of ice-cream at Scoops. We stayed 4 nights and it was a true get-away. Within walking distance of the quaint town of Covington with shops and restaurants, our visit to Twelve Oaks Covington was a trip we will always treasure!